The University has canceled all classes and non-essential activities for Wednesday due to extreme weather, administrators announced in an e-mail sent Monday afternoon. The National Weather Service has issued a warning and expects temperatures to drop on Wednesday to at least 20 degrees below zero with a wind chill of at least 50 degrees below between 4 and 9 a.m. 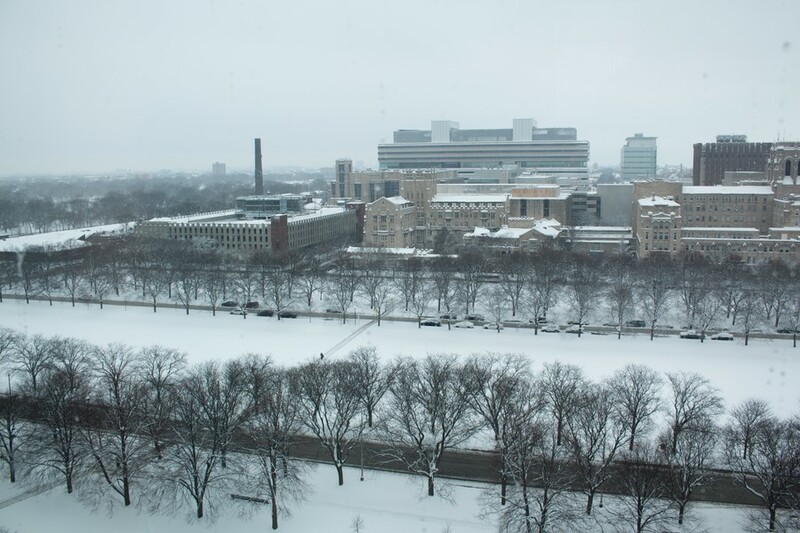 Despite closing the Laboratory Schools and the four campuses of the University of Chicago Charter Schools for both Tuesday and Wednesday, the University did not elect to cancel classes on Tuesday or Thursday, despite similarly cold weather predictions. All essential services and residential facilities—including dining and residence halls, the University Medical Center, safety personnel, the Student Health Service, and the Student Counseling Service—will remain open. University Transportation and Shuttle buses will continue to operate Wednesday unless the weather makes this hazardous. All library facilities and eateries, Ida Noyes, and Reynolds Club will be shuttered on Wednesday. University Security Personnel, while present, will not be stationed outdoors. Furthermore, the Gleacher Center and NBC Tower will be closed downtown. Ida Noyes, Reynolds Club, Hallowed Grounds, the Ex Libris and Harper Cafés, and Cobb Coffee Shop will all close early Tuesday evening. Ratner Athletics Center will be closed on Wednesday, close early on Tuesday at 8 p.m., and open late on Thursday at 9 a.m. Henry Crown Field House will also be closed on Wednesday, close early on Tuesday at 9:30 p.m, and open late on Thursday at 9 a.m.
RSO leaders have been advised to cancel any programming occurring Tuesday evening and remain indoors. Bar Night is cancelled, according to a representative from Alpha Delta Phi. Students and University personnel are cautioned to avoid travel and remain indoors if possible. In the event that students do venture outdoors, the National Weather Service advises that no skin should remain exposed as frostbite will set in after 10 minutes of exposure, and the damage may be irreversible. Early symptoms of frostbite and hypothermia include burning, pins, and needles, and loss of feeling in the extremities. The NWS advises anyone with any of these symptoms to return indoors immediately. This closure marks the second time the University has canceled classes in recent years. In January 2014, classes were canceled due to extreme weather, and in November 2015, all classes were canceled due to a potential terrorist threat. All classes and non-essential activities are expected to resume on Thursday, January 31. Update Jan. 28, 8:38 p.m.: A representative from Alpha Delta Phi confirmed that Bar Night is cancelled. Update Jan. 28, 9:09 p.m.: Ratner Athletics Center and Henry Crown Field House will be closed on Wednesday and will have modified hours on Tuesday and Thursday. Update Jan 30, 8:00 p.m.: Due to further inclement weather, the University has extended the closure through 12:00 p.m., Thursday Jan 31. The caption for the photo of the plow truck has been corrected to say that the truck is outside of Ratner. The caption previously said the truck is outside of Crown.